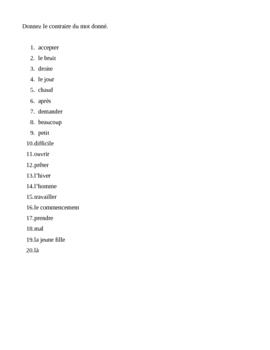 Set of 9 worksheets; 2 for end of French I / beginning of French II; 2 for French II; 5 for French III and above. Worksheets are 1 of 2 formats: give antonym or matching. Good for substitute lesson, enrichment, or end of year vocabulary review. 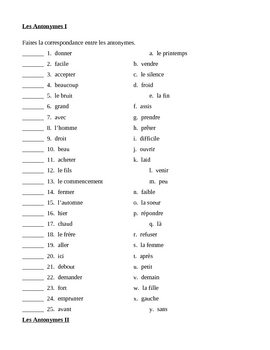 Vocabulary corresponds to the Amsco French workbooks, but worksheets may be used with any textbook.